Oi YOU! 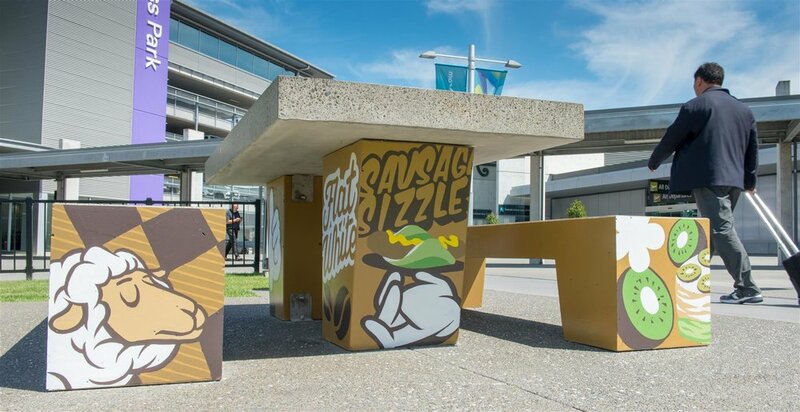 have produced the first phase of a series of street art installations, that they've been commissioned to deliver, to brighten up the visitor experience at Christchurch Airport. Oi YOU! brought in Christchurch street art legend Dcypher to work alongside Paul Walters and Clint Park to paint 7 mini murals, a concrete picnic table, 3 wooden benches and a piano, there for the public to tickle the ivories on! Dcypher created the designs for a series of mini murals, situated in the airport's main concourse, that represent the diversity of flora, fauna and dramatic landscapes of the South Island. Paul Walters of Identity Signs is on of New Zealand's foremost exponents of traditional sign writing. He designed and produced the fabulous work on the piano that's there to encourage the general public to play it. Also on board was Clint Park another local artist (and local legend) who works under the name of Porta. He beautified a series of benches for us before picking up a paint brush and getting stuck in to make sure we got finished on time. This was picking up on the fact that Dcypher, born and raised in Christchurch but now living in Los Angeles, has worked on some pretty epic projects. Check out the whole Star Media story here. The process of getting to the point of putting paint on surfaces has taken over 12 months, with Oi YOU! working very closely and collaboratively with fabulous creative team at Christchurch Airport. As mentioned above this this the first of a series of works that we are working on with the Airport so watch this space!